Every year, we come back to the Holy Thursday ceremony of the washing of the feet -- and all the inevitable controversy that surrounds it when women are included among the group whose feet are washed, in spite of the use of the masculine word viri in the liturgical rubrics. Sadly, we seem to be living in a time where liturgy so often becomes another socio-political statement, thanks to a pervasive disregard for the wisdom of Catholic tradition and the simultaneous conviction that we ourselves are the masters and possessors of the liturgy, that we know better than our benighted forebears. Liturgy then risks turning into a declaration of our preconceptions, priorities, and politics. How many people consider themselves bound to do things the traditional way because they have a fundamental trust that this way is good, holy, wise, greater than I am, and ready to teach me spiritual lessons if I but apprentice myself to it? I would like to suggest, however, that in regard to the Holy Thursday mandatum ceremony, we can learn a valuable lesson from the Cistercian tradition, one that could resolve even this particular dispute in a surprisingly sympathetic manner. First, we must recognize that Our Lord's washing of the feet has a double aspect to it, which, it seems to me, accounts for some of the confusion we have managed to introduce by not thinking through how these two aspects are related. One aspect is the washing of the apostles’ feet at their ordination and the first Mass. Here, the accent is definitely placed on the apostolic college as the kernel of the new ministerial priesthood of the new covenant. The other aspect, of course, is the washing of the feet as a symbol of serving one’s fellow man in general, even as Christ came not to be served but to serve and to give his life as a ransom for many. Thus we have something of a paradox here: a symbolic action of universal application is nevertheless being given at a very particular event in salvation history with a very special group of men—not just any human beings, not just any male individuals, but the first priests and bishops of the Church. The Virgin Mary was holier than all of them put together, she offered her Son most perfectly the next day at the foot of the Cross, and she guided the nascent Church in profound ways we will understand only in heaven. And yet she was not called upon to offer the Eucharistic sacrifice nor to govern local churches, as the Apostles and their successors did; nor was she among the men whose feet were washed at the Last Supper. This tension in the mandatum between the universal charity symbolism and the particular apostolic/priestly symbolism makes it necessary to choose ONE or the OTHER as the prime symbol. Yet there is an assymetrical relationship between these. If you mix in the women, you are opting for the universal charity message and excluding the ordination message; whereas if you simply have men, as the rubrics specify, you are opting for a reenactment of what Christ did that evening at the first Mass, but you are not excluding the charity symbolism. After all, the very heart of the sacrifice of Christ was His burning charity for God and man, and this is the love the apostles, as His priests, are to carry into the world. In any case, the way the ceremony is done should not, as it were, garble the message so that one ends up severing the universal message from its original sacramental context. While many activities related to water took place in the gallery nearest the fountain, the mandatum was performed in the collation cloister. 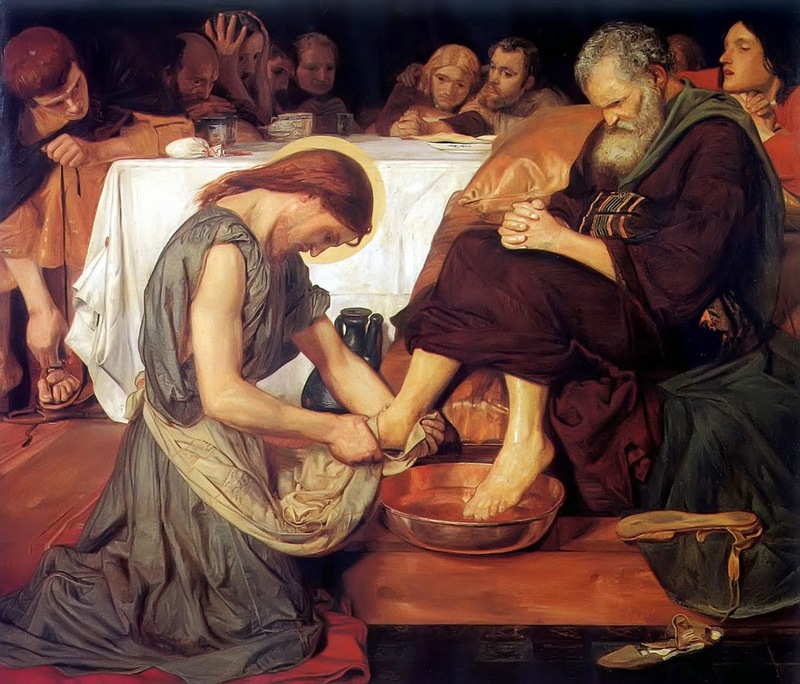 The weekly mandatum, or ritual washing of the feet, takes its name from the commandment of Jesus (John 13:34), which was also the text of an antiphon sung during the ceremony: “Mandatum novum . . .” (“A new commandment I give you . . .”). The ritual was a reminder of humility and also of charity toward one’s neighbors, whether those in the community or those outside. It was obviously inspired by Christ washing the feet of his disciples, and it was commonly practiced in the early church as a simple act of charity, recommended by Saint Paul (1 Tim. 5:10). The community mandatum took place just before collation and Compline on Saturday afternoon, and, as specified in chapter 35 of the Rule of Saint Benedict, the weekly cooks—incoming and outgoing—performed the ceremony. The cooks who were leaving their week’s duty were responsible for heating the water in cold weather. The monks sat along the benches in this gallery, and the ritual began when the abbot (or cantor in the abbot’s absence) intoned the antiphon Postquam. After the abbot took off his shoes, the community followed, but as foot modesty was very important, the brothers were instructed to keep their bare feet covered at all times with their cowls. The senior (in monastic rank) of the two monks entering his week’s kitchen service washed the abbot’s feet first, while the junior incoming kitchen brother dried his feet; this pair continued washing and drying the feet of all the monks sitting to the left of the abbot. At the same time the senior of the cooks leaving his weekly service washed the feet of the brothers to the abbot’s right, the junior outgoing cook drying; the pair finishing first went to the other side to help. The cooks then washed their hands along with the vessels and towels, and everyone put their shoes back on before the collation reading began. On Holy Thursday preceding Easter, this ceremony had a special form, the mandatum of the poor. The porter chose as many poor men from the guesthouse as there were monks in the monastery, and these men were seated in this cloister gallery. The monks left the church after None, the abbot leading and the community following in order of seniority, until each monk was standing in front of a guest. The monks then honored the poor men by washing, drying, and kissing their feet and giving each one a coin (denier) provided by the cellarer. Later the same afternoon, the community mandatum was held, and it, too, had a special form on this day. In imitation of Christ washing the feet of the twelve disciples, the abbot washed, dried, and kissed the feet of twelve members of the community: four monks, four novices, and four lay brothers. His assistants then performed this ceremony for the entire community, including all monks from the infirmary who were able to walk, and all lay brothers. We see, then, that the activities carried out in the gallery parallel to the church were activities of a spiritual nature—much like those carried out in the church itself. In every case they emphasized the Christian life in community, whether directed inwardly to oneself (the collation reading) or, in the mandatum, shared among others. The weekly mandatum recalled the unity-in-charity of the monastic community; the Holy Thursday mandatum linked that community to Christ and his disciples; and the mandatum of the poor symbolized the responsibilities of the community to the world of poverty and suffering beyond the abbey walls. Could we not think of ways in which to imitate and adapt the monastic custom in its thoughtful distinction of the two aspects of the mandatum? Could there be a washing of the feet of (e.g.) prisoners or the elderly or the handicapped that was not embedded, misleadingly and acontextually, in the liturgical commemoration of the Last Supper on Holy Thursday? It seems to me that we may be victims of a too limited imagination when it comes to the way the liturgy (and the rich symbols of the liturgy) can spill out into parish activities, outreach programs, or other domains of Catholic life. Are we trying to jam everything into the Mass? We will certainly end up making a mess of it, if that's the line of thinking we are following. Whereas if we allow the powerful deeds of Christ to sink into our consciousness, we will, like the Cistercians, develop a plethora of ways to express the inexhaustible richness of the Gospel, like streams branching off of a river. Terryl N. Kinder, Cistercian Europe: Architecture of Contemplation (Grand Rapids: William B. Eerdmans; Kalamazoo: Cistercian Publications, 2000), 136-37. To read more about how the Cistercians at Heiligenkreuz live out this practice even today, see this article by Fr. Edmund Waldstein, O.Cist.